Etching is traditionally the process of using strong acid or mordant to cut into the unprotected parts of a metal surface to create a design in intaglio (relief) in the metal. In modern manufacturing, other chemicals may be used on other types of material. As a method of printmaking, it is, along with engraving, the most important technique for old master prints, and remains in wide use today. Etching is a very mechanical process. 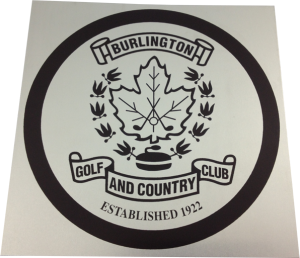 A zinc plate is coated and scratched by an etching needle, or painted with a design, and is then etched by acid in a controlled reaction. This forms an image on the plate that will hold ink. The inked plate and paper is run through an etching press which presses the plate image to the paper. The art of etching involves the variety of methods used to form the image on the plate. Etchings are typically black ink on white paper. Color is usually not involved. Some see this as a limitation; I see endless possibilities. The unique mechanical process of etching allows for a wide variety of shapes, textures and resonant grays and blacks that are not possible with any other medium. 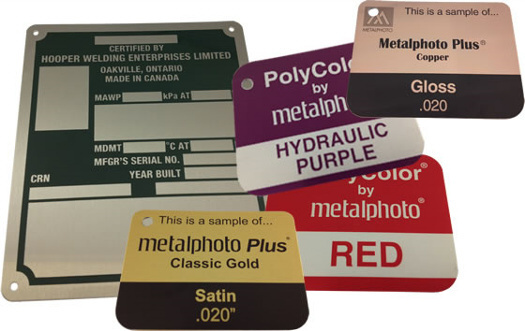 Etched nameplates are recommended for harsh indoor or outdoor applications where exposure to weather, temperature extremes, sunlight, chemicals, solvents, fuels and lubricants is possible. Images are chemically etched into the substrate surface and could be filled with ink for added aesthetic and functional value. They are particularly suited for industrial, marine, aircraft or automotive applications. 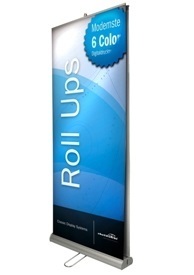 Top Worth Advertising provides custom made high quality Signs, Nameplates and Dataplates. 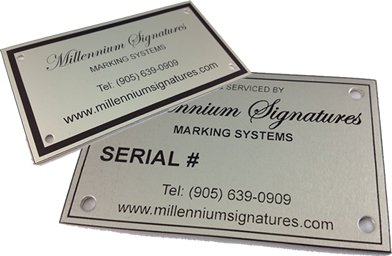 We offer several different nameplate technologies, however one of our most popular is our Metal Photo and Anodized Aluminum Nameplate product. These plates are exceptionally durable and withstand exposure to the natural elements and most chemicals with extensive studies done to validate their longevity in various environments.